Samaritan's Purse volunteers are working to help homeowners in Texas. 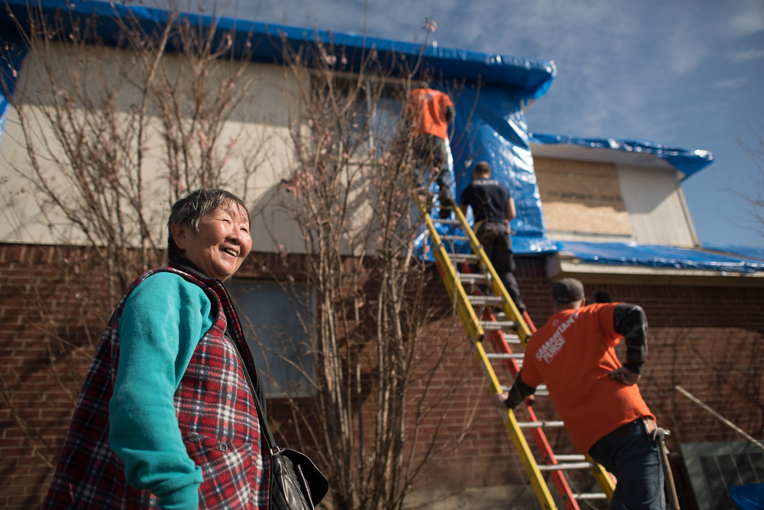 Samaritan’s Purse volunteers were able to help save Hiroko “Koko” Nakamatsu’s home by tarping her roof and pulling up waterlogged flooring. But more importantly, by sharing the Good News of Jesus Christ with Koko, the volunteer team witnessed God saving her soul. When an F-4 tornado ripped through the Dallas suburb of Rowlett shortly after 7 p.m. on December 26, Koko was upstairs in her house. Water was pouring through holes in the second-story roof. She grew scared, ran downstairs, and raced next door to Lucy and Noah’s home, where they hunkered down in an interior closet and rode out the storm. Now a sister in Christ, Koko is grateful for the support she received from Samaritan’s Purse. When Lucy learned that Koko, a 73-year-old widow originally from Tokyo, did not have insurance, she took her Tuesday to a special “market,” where different organizations and services were gathered in a central location to tell homeowners what relief services they could provide. Samaritan’s Purse and the Billy Graham Rapid Response Team chaplains were represented, and RRT chaplain Jeanie Tidwell met Koko. Jeanie told Koko not to worry and that Samaritan’s Purse would be glad to help her. On Wednesday, our volunteers showed up at Koko’s house and got right to work. They ripped up flooring and then started securing blue tarp across her roof. In a quiet moment, Samaritan’s Purse Team Leader Marv Behr explained to Koko about God’s unending love and how that love was demonstrated when Jesus Christ died on the Cross for her sins and then when God raised Him to life. Marv asked Koko if she would like to receive Christ as Savior and Lord, and Koko committed her life to Him. 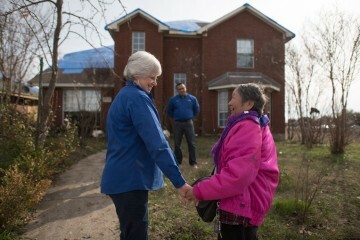 RRT chaplain Jeanie Tidwell stands with Koko in front of Koko’s damaged Texas home. On Thursday afternoon—New Year’s Eve—the Samaritan’s Purse volunteers finished up at Koko’s house. At that time, RRT chaplain Jeanie Tidwell stopped by. When Koko saw her, they hugged, then Koko grabbed Jeanie’s hand and took her through her house, showing her everything Samaritan’s Purse had done. “He’s in my heart,” Koko answered. Volunteer Ray Allen from Arkansas spent the end of 2015 working on Koko’s home. Koko smiled. They hugged again. The Samaritan’s Purse volunteers gathered in a circle, sang the hymn “Come Thou Fount of Every Blessing,” and prayed with Koko. In a nearby section of Rowlett, Samaritan’s Purse volunteers were coming alongside Richard and Lavonda Montemayor. The powerful tornado severely damaged their home, while the couple was having dinner with friends in Plano. As soon as they arrived home, Richard opened the front door and was greeted by their 11-pound Cockapoo. Homeowners Richard and Lavonda Montemayor were assisted in their cleanup by Samaritan’s Purse volunteers. Our volunteers chainsawed trees that had been leveled, cleared debris, and removed waterlogged insulation from inside their house. Richard and Lavonda were not familiar with Samaritan’s Purse before this Christmastime tragedy affected them. “I had never heard of them, but I’m definitely going to pray for ya’ll, and get the word out to everybody [about] what you have done for us,” Richard said. “We are really thankful for all their help,” Lavonda added. 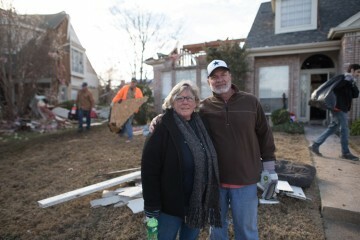 Among the volunteers coming alongside the Montemayors were Rick and Betty Davidson, a retired couple from Granbury, Texas. 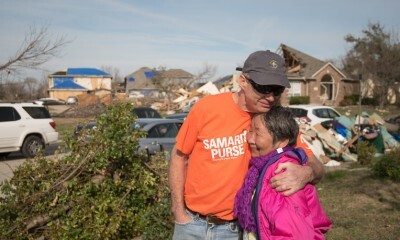 Betty volunteered with Samaritan’s Purse after a tornado ravaged Granbury in 2013. Rick recently retired and now they together serve in disaster relief work as they’re able—including driving all night to Columbia, S.C., in September to help in Jesus Name following the epic floods there. 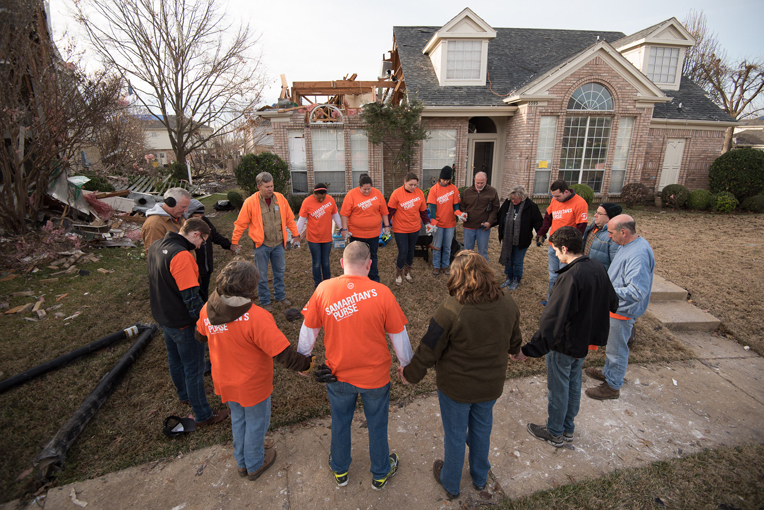 Samaritan’s Purse volunteers pray with the Montemayors at their home. Samaritan’s Purse teams are also fanning out in the DeSoto and Glen Heights area about 40 miles southwest of Dallas. And they’re coming alongside suffering homeowners in a three-county area in North Mississippi. Please continue to pray for God’s protection, strength and grace as these volunteers serve our Lord in the days and weeks ahead.